(PRLEAP.COM) The Refrigeration School, an Arizona-based vocational training school, has published a white paper to its website to guide individuals through the process of finding the right HVAC school and determining which programs will offer the best vocational training experience. The paper goes over the three top qualities potential students should look for in a program as well as a methodology for narrowing down a skilled trades program. the time that students remain in the training program while helping them quickly learn the skills that employers are looking for in strong job candidates. 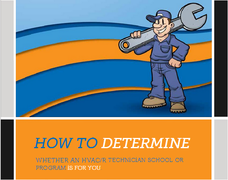 Some of the most important qualities to have in an HVAC technician program are a high level of hands- on training, proper accreditation, and support from a local licensure board. These qualities ensure that a student is getting the practical training and experience he/she needs to later work in the field, and the program is being held accountable by respected 3rd party sources to maintain high standards of education and student support. These components are the cornerstone of a solid technical education, and students should be wary of any programs that lack them. The Refrigeration School is an HVAC technician school in Arizona with programs for HVAC, solar/pv installation, mechanical maintenance engineering, and refrigeration technologies. For more information about local career opportunities in HVAC contracting, contact an RSI Admissions Representative: https://www.refrigerationschool.com/.